March 28, 2007: The landing site is unknown. The rockets are still on the drawing board. Some of the astronauts haven't even been born yet. Never mind all that. NASA's journey to Mars has already begun. The first steps are being taken onboard the International Space Station (ISS). "Astronauts are stationed on the ISS for six months at a time," says Dr. Clarence Sams, lead scientist for the ISS Medical Project at NASA's Johnson Space Center (JSC). "Coincidentally, that's about how long it takes to travel to Mars. We can't simulate every aspect of a 50 million mile journey to Mars," he says, "but there are many questions we can answer from low Earth orbit." For example, what happens to food and medicine exposed to six-plus months of space travel? Curiously, food kept in orbit seems to lose some of its nutritional impact. Post-flight tests run on astronauts show that "blood and urine markers of nutritional status didn't match expected levels of nutrients in space foods," reports Dr. Scott Smith, head JSC's Nutritional Biochemistry Laboratory. Furthermore, researchers at JSC's Pharmacotherapeutics Laboratory noticed that some medicines returned from orbit had lost their potency. This could be a sign of radiation at work: high-speed particles of space radiation occasionally smash into nutrient or medicine molecules, perhaps damaging those molecules and preventing them from functioning properly. So far, though, it's speculation. Neither the cause of the food and medicine breakdown nor how much breakdown is occurring is yet known, say the researchers. "We may have to come up with a plan for protecting our supplies," continues Sams. "How fast do food and medicines degrade? Are we going to have to put supplies in a radiation-shielded area for the entire trip?" 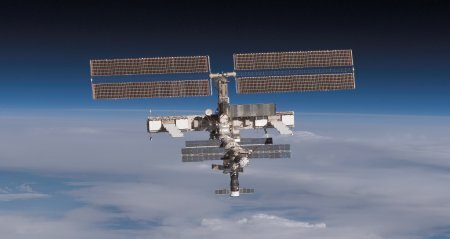 To help answer these questions, an experiment running on the ISS called Stability of Pharmacotherapeutic and Nutritional Compounds places three identical sets of food and medicine on the station. One will be returned to Earth after 6 months, the second after 12 months, and the third after 18. That way Scott M. Smith and Lakshmi Putcha, principal investigators for the project at JSC, can figure out the rate at which the foods and medicines lose their potency. This information is important because food and medicines must survive not just the six-month trip to Mars, but the full 3 years of a Mars mission. 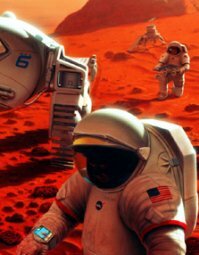 Exposure times might even be longer if mission planners decide to send cargo capsules filled with stashes of food and medicine to Mars before the crew leaves Earth. Other experiments on the ISS examine the bodies of the crew themselves, requiring them to take blood and saliva samples and sonograms while aboard the station. "There is already quite a bit of data from shuttle flights and such, but you must understand, a lot of the measurements of the past were made pre-flight and post-flight. [We] need to know what's going on in between, during the mission," Sams explains. For example, it's well known that people lose bone and muscle mass while in weightlessness. But scientists still don't know how that loss progresses while an astronaut is in space. Is there an initial, rapid loss as the body adjusts to being in space, followed by a plateau? Or is it a steady, relentless decline? When planning on being away from Earth's gravity for 3 years or more, these questions become important. Other questions -- such as how the body reacts to the partial gravity of the Moon or Mars -- will have to wait until NASA sends astronauts back to the Moon in the coming decade. Meanwhile, says Sams, the ISS is an excellent place to start.